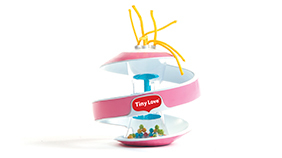 Stimulating, spiraling and fun-filled toy. Development is all around! 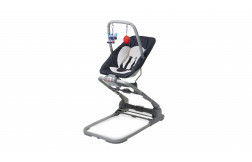 Features an easy-to-grip design, soft texture and a swirled innovative spiral structure that allows baby to reach and explore the toys inside & out. Includes a rainstick game that stimulates auditory perception and soft satin ropes for tactile stimulation. 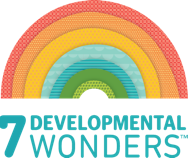 Promotes natural growth and development with stimulating activities, shapes and textures, particularly supporting development of the senses and fine motor skills. Available in soothing turquoise and pink. 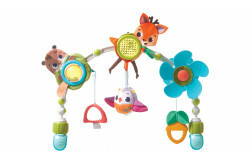 Let baby explore the toy with hands and mouth, shaking the rainstick toy to stimulate auditory perception and exploring the soft satin ropes for tactile sensation. 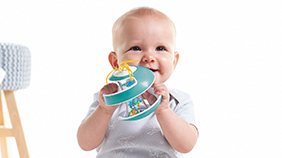 When crawling kicks in, let baby enjoy pushing the ball away and delighting in its unique roll-back movement while continuing to enjoy exploring its fun features. 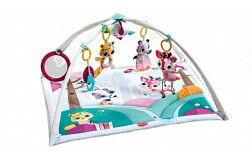 Exploring the fun features included in Inspiral challenges and promotes fine motor skills and motor development. The sound of the rainstick game and the soft satin ribbons stimulate baby's senses of sound and touch and encourage auditory and tactile exploration. 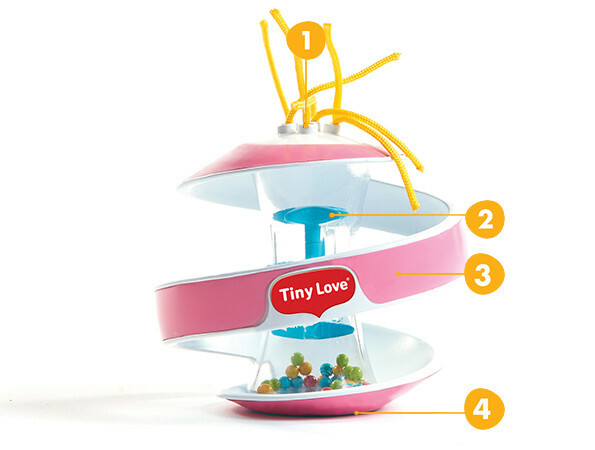 The spiraling structure and sliding beads stimulate cognitive skills.